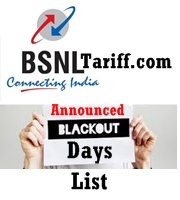 Bharat Sanchar Nigam Limited (BSNL) has repeated again and released blackout days list on account of ensuing festivals and occasions. On the above days there would be “No free or discounted SMS will be available to existing / new customers, who have subscribed to SMS STVs or have free SMS offered along with new subscription. Note: Subject to varies the day 31-12-2012 in BSNL Telecom Circles according to their technical feasibility and their promotions.